Outdoor advertising is undeniably one of the best categories of advertising to promote your small business. Recall rates are super high, and the CPM (cost per 1000 impressions) is extremely low. That is especially true with Bedfin pickup truck billboards, because the message panels are reuseable and available at nearly any print shop. 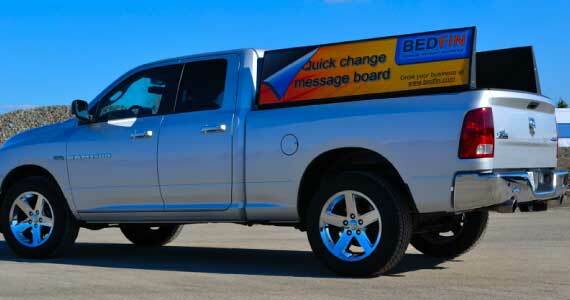 Bedfin offers a couple distinct advantage over truck wraps and transit advertisements, like those on buses and taxis. - You are near your truck sign, and can talk directly with your audience. - You control the route. - You can change the sign any time you like. These benefits allow you to test and adjust your advertising to ensure it is optimized to be the most effective advertisement possible. This is not possible with a wrap due to the high cost of change-outs and it's not possible ith transit ads because you do not have the immediate control. So how would you use your Bedfin truck signage? Do you have new locations to advertise? New products? How about seasonal services or limited time offers? The possibilities are limited only by your creativity. With Bedfin, your advertising costs are minimal, so don't hesitate to be bold. Find out how you can accellerate your business growth today. Promote your business and accessorize with cargo racks, tie downs, and more. 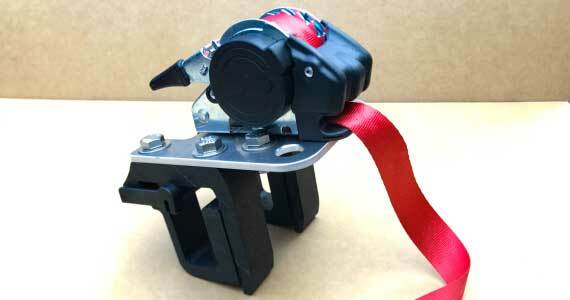 Increase the productivity of your truck with this fast and secure cargo restraint. See how customers are putting Bedfin to work for their businesses. Step up your productivity while increasing your cargo space & safety. HOW MUCH DOES A TRUCK WRAP COST? There are a number of variables affecting the cost of a wrap, so it's hard to make a definitive statement (by the way, you'll hear that with every installer you ask). There's no one-size-fits-all type of answer. You can count on spending anywhere between $1,500 and $4,000 depending on factors such as whether it's a partial wrap or a full wrap, whether your truck has complex contours or simple, and depending on the materials used. The most important factor in cost is the quality of the installer and the materials. If you're opting for a low cost installer, you may want to rethink that decision. From bubbling and cracking vinyl to damage to your vehicle, many things can go wrong. Everything from the preparation of your truck to the techniques of the installer will lead to the success or failure of your wrap. Done poorly, a bad wrap may cost you more money than it makes you in the long run - maybe in the short run, too. The environment you drive in may also limit your recourse to having your wrap fixed under warranty. All that said, one of the biggest costs of a wrap is not the out-the-door cost of installation and the materials, but the sacrifice of flexibility. Since a wrap will generally last 3-7 years in the right conditions, you won't likely change it out for a new design anytime soon. This may be fine if you only want to display information which isn't going to change. That means your logo, a generic description of your business, and your color scheme. You wouldn't use a wrap to advertise things like seasonal services, limited time offers, or to promote whatever you have an abundance of at the time. That is unless you want to spend the money to redo your wrap in part of in full. Doing so doens't only cost the money for installation, but also downtime for your work truck. After all this, you may be thinking wraps are a bad investment, but that's not true. Like any tool, wraps have a purpose and come with limitations. 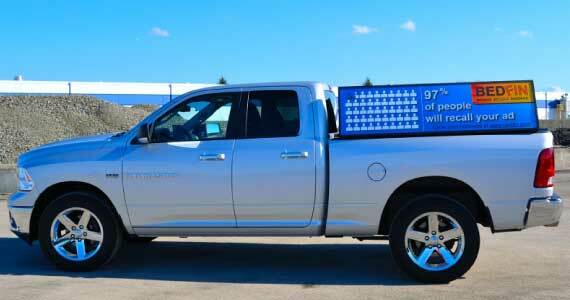 If you're considering a wrap, investigate Bedfin mobile billboards at the same time. With a price at the lower end of the wrap-cost-spectrum, Bedfin offers far more flexibility without risk of damage to your vehicle and no downtime. Read on to learn more about Bedfin's features and benefits which will support the growth you want for your business. 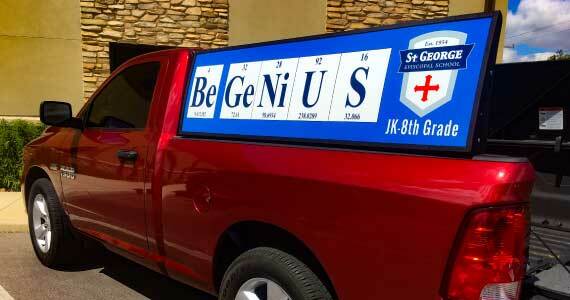 Your Bedfin mobile billboard offers utility beyond just advertising. Expand your system with accessories to increase your work productivity. 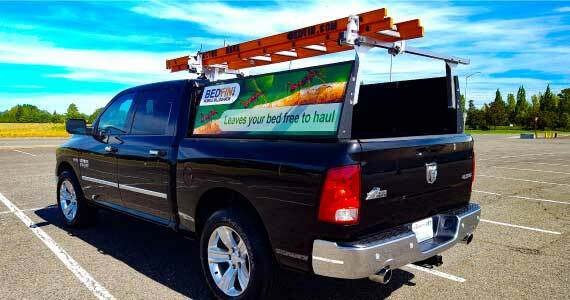 From hauling a ladder to building materials, Bedfin assists you with additional cargo space. Whether you call it a cargo rack, ladder rack, or contractor rack, just consider it's one more way Bedfin keeps your bed free to haul more. Click the arrow for more details. In the beginning, Bedfin was designed by and for the founder. From the robust design to the selection of materials, a constant focus on quality has been maintained. Knowing rust would not be tolerated at any point in the product's life, only aluminum and stainless metals were used. Even today, with the demand to keep the product affordable, Bedfin resists the notion to switch to cheaper materials. Bedfin LLC © | Thank you for visiting.